Once a fire has started the most efficient way to extinguish it is by removal of the heat by cooling, water being the favoured medium. The Fire Brigade, when and if they are called and then 5 to 10 minutes before the first water is applied. A fire sprinkler will actuate and extinguish the fire automatically whether the building is occupied or not. This will reduce the risk of injury and death and minimise damage due to heat, smoke and water. In the UK there has been no loss of life in properties where fire sprinklers have been installed, this includes both commercial and residential premises. A fire sprinkler system is a network of piping charged with water either from a water main or fire pump and tank. Fire sprinkler heads are connected to the pipe work in the areas to be protected. First things first, fire sprinklers are NOT triggered by smoke and do NOT all go off together despite what is shown in movies and TV advertising. Fire sprinklers are actually heat activated and only the sprinkler head above the fire will actuate. In 98% of cases fires are extinguished by the actuation of just one sprinkler head. If the fire is severe and spreads quickly then the next closest sprinkler head will actuate when the required temperature is reached. When a fire starts, the resulting smoke will normally actuate a smoke detector which should warn any occupants of the danger. This can take some time depending where the smoke detector is located, in the meantime the fire is growing. 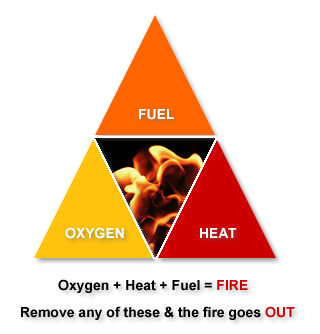 A result of a fire is that the air directly above it gets hot. This hot air rises up to the ceiling and is pushed out laterally across the ceiling. When this hot air reaches a sprinkler head, that sprinkler head is actuated. Fire sprinkler systems installed by Triangle Fire Systems have recently actuated and extinguished fires in four residential properties. In all instances only one sprinkler head was activated and the fires were successfully extinguised prior to the arrival of the fire brigade. Specialised housing scheme, a bedroom fire caused by the careless disposal of smoking materials. Sheltered housing scheme, a cooker fire occured in the flat of an 82 year old resident. Residential tower block, a fire occured where a chip pan had caught light in a flat on the 13th floor. Residential tower block, a chip pan fire occured in an apartment in a 9 storey apartment block. The fire was extinguished in just 5 seconds.